I have been a patient of Dr. Jeffrey Markett for several years now, and I cannot say enough about the care he has given me. I recently had him complete my teeth whitening and re-do some old crowns, and I am very happy with the final results! I have received many compliments from family and friends. He is extremely professional, as well as friendly with an awesome chair side manner. His staff is top notch as well. It is always an all-around great experience! If you are in the market for a new dentist, Dr. Markett is the man to see. You will be happy you did! My family has been seeing Dr. Markett since we moved to Lombard almost 20 years ago. The most amazing thing is how painless visits to his office are. And we have had some serious work done over the years, not just cavities but also crowns, bridges, and root canals. As we are getting older and our teeth are more brittle the crowns are becoming more frequent. But he has a process that will get the entire crown made while you take a few hours to read a book or catch up on e-mails. No temporaries to deal with. He and all his staff are so pleasant and easy to work with. A good sense of chair-side humor makes even a cleaning zip right by. You can’t go wrong choosing him for your dentist. My family and I have been going to Dr. Markett for several years and never have we had to wait to see the doctor. He is always on time and that is a rarity for many doctor’s. Dr. Markett has always been very honest with our dental needs and he has never tried to suggest something that wasn’t needed. I appreciate Dr. Markett’s honesty and his consideration of his patients time. My husband and kids see Dr. Markett and he has never let any of us down! If your considering Dr. Markett as your Dentist, I can tell you, you won’t be disappointed! I have been a patient of Dr. Jeffrey J. Markett’s for a few years now and the care and service he has provided, along with his wonderful staff, has been astounding. I came to him with numerous dental problems and he has been upfront about every procedure and provided me with the care and concern patients rarely receive anymore. If I ever have any questions or concerns, he is just a phone call away and does not hesitate to make sure his patients have what they need. When I was referred to Dr. Markett, I did not think I would be this happy or actually look forward to going to the dentist but here we are. Thank you for everything Dr. Markett! Dr. Jeff Markett, and his team of two lovely colleagues, Gaye and Samantha, are friendly, approachable, organized, efficient, and knowledgeable. I am quite picky when it comes to all types of doctors. I will be a loyal patient with Dr. Markett! I believe they accept many types of insurance such as Cigna. Thank you to Dr. Markett, and his team, for being of service. I highly recommend to everyone! As a new patient, I had a great experience with Dr. Markett because he is very honest and kind. He also has a very friendly hygienist and receptionist. I look forward to my next 6 month appointment with him! I have been to some dentists in the past and have had horrible experiences, but I must say that I am extremely pleased with all the work done by Dr. Markett; he is very in tune with his patients and always makes sure you are comfortable and in virtually no pain. I recently went in to get my last wisdom tooth extracted and was pretty nervous. By the time I realized he had started the procedure and wasn’t just checking to see if I was numb, he was done. When I woke up the next day there was almost no pain at all, where as in the past the pain lasted for days! I will recommend Dr. Markett and his staff to both my family and friends. Thank you very much, you have changed my opinion of going to the dentist! I have been a patien of Dr. Jeffrey Markett, Dentistry of Lombard, for over 25yrs. He provides a first-rate, very personal, exceptional standard of care. He communticates with his patients and the word that best describes his service is painless. The office staff is friendly and extremely professional. I would give this office my highest recommendation. It might seem that supermodels have a fairly easy life — except for the fact that they are expected to look perfect whenever they’re in front of a camera. Sometimes that’s easy — but other times, it can be pretty difficult. Just ask Chrissy Teigen: Recently, she was in Bangkok, Thailand, filming a restaurant scene for the TV travel series The Getaway, when some temporary restorations (bonding) on her teeth ended up in her food. Like stress, teeth grinding is a problem that can affect anyone, supermodel or not. In fact, the two conditions are often related. Sometimes, the habit of bruxism (teeth clenching and grinding) occurs during the day, when you’re trying to cope with a stressful situation. Other times, it can occur at night — even while you’re asleep, so you retain no memory of it in the morning. Either way, it’s a behavior that can seriously damage your teeth. When teeth are constantly subjected to the extreme forces produced by clenching and grinding, their hard outer covering (enamel) can quickly start to wear away. In time, teeth can become chipped, worn down — even loose! Any dental work on those teeth, such as fillings, bonded areas and crowns, may also be damaged, start to crumble or fall out. Your teeth may become extremely sensitive to hot and cold because of the lack of sufficient enamel. Bruxism can also result in headaches and jaw pain, due in part to the stress placed on muscles of the jaw and face. You may not be aware of your own teeth-grinding behavior — but if you notice these symptoms, you might have a grinding problem. Likewise, after your routine dental exam, we may alert you to the possibility that you’re a “bruxer.” So what can you do about teeth clenching and grinding? We can suggest a number of treatments, ranging from lifestyle changes to dental appliances or procedures. Becoming aware of the behavior is a good first step; in some cases, that may be all that’s needed to start controlling the habit. Finding healthy ways to relieve stress — meditation, relaxation, a warm bath and a soothing environment — may also help. If nighttime grinding keeps occurring, an “occlusal guard” (nightguard) may be recommended. This comfortable device is worn in the mouth at night, to protect teeth from damage. If a minor bite problem exists, it can sometimes be remedied with a simple procedure; in more complex situations, orthodontic work might be recommended. You’re considering dental implants and you’ve done your homework: you know they’re considered the best tooth replacements available prized for durability and life-likeness. But you do have one concern — you have a metal allergy and you’re not sure how your body will react to the implant’s titanium and other trace metals. An allergy is the body’s defensive response against any substance (living or non-living) perceived as a threat. Allergic reactions can range from a mild rash to rare instances of death due to multiple organ system shutdowns. A person can become allergic to anything, including metals. An estimated 17% of women and 3% of men are allergic to nickel, while 1-3% of the general population to cobalt and chromium. While most allergic reactions occur in contact with consumer products (like jewelry) or metal-based manufacturing, some occur with metal medical devices or prosthetics, including certain cardiac stents and hip or knee replacements. There are also rare cases of swelling or rashes in reaction to metal fillings, commonly known as dental amalgam. A mix of metals — mainly mercury with traces of silver, copper and tin — dental amalgam has been used for decades with the vast majority of patients experiencing no reactions. Further, amalgam has steadily declined in use in recent years as tooth-colored composite resins have become more popular. 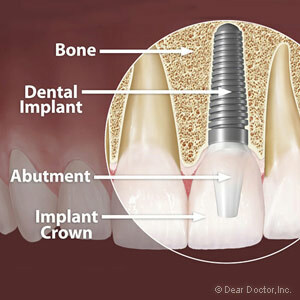 Which brings us to dental implants: the vast majority are made of titanium alloy. Titanium is preferred in implants not only because it’s biocompatible (it “gets along” well with the body’s immune system), but also because it’s osteophilic, having an affinity with living bone tissue that encourages bone growth around and attached to the titanium. Both of these qualities make titanium a rare trigger for allergies even for people with a known metal allergy. Still, implant allergic reactions do occur, although in only 0.6% of all cases, or six out of a thousand patients. The best course, then, is to let us know about any metal allergies you may have (or other systemic conditions, for that matter) during our initial consultation for implants. Along with that and other information, we'll be better able to advise you on whether implants are right for you. Dr. Markett was born and raised in the Chicago suburbs. He graduated from Loyola University and obtained this Doctor of Dental Surgery (D.D.S.) from Loyola Dental School. Read more about Dr. Markett.